Boxhead: Halloween is an interesting action game. 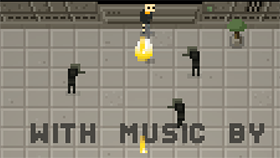 This game has simple graphics, suitable for all ages, especially those who like zombies. You can experience this game on your browser because it is a flash game. In this game you will be a zombie hunter, your task is to kill all the zombies in the map and complete the tasks that the game requires. This game has many levels, each level is a challenge for you. In each level, you will have to complete various tasks with time pressure. For example, in level 1, your mission is to rescue 5 hostages. You will have to move these hostages to the location of the X point on the map. Your enemies are zombies, if you let them approach you, they will kill you. So you need to destroy them with your pistol. The interesting point in this game is that after completing level, you will have new, stronger and better weapons. However, these guns will have limited ammunition, when you run out of ammunition you will not be able to use them anymore. Use 1-2-3-4 to change weapons.